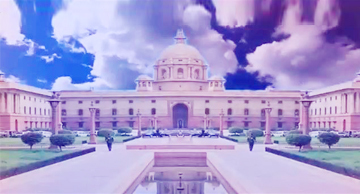 The Ministry of External Affairs is largely located in South Block, a building that also houses the Prime Minister's Office and the Ministry of Defence.Offices of Ministry of External Affairs are also housed in Jawahar Lal Nehru Bhavan, Shastri Bhavan, Patiala House and ISIL Building. South Block, and North Block situated across the road, were built on top of Raisina Hill in 1931. Designed by Herbert Baker, one of Britain's most distinguished architects of the early 20th Century, the two impressive Secretariat buildings flank Rashtrapati Bhavan on each side of the Central Visitor. South Block is an intricate labyrinth of vaulted staircases and high ceiling passages. Colonnades and flat roofs, dominated by huge domes are striking features of this building. Herbert Baker, as well as Edwin Lutyens who designed government buildings for New Delhi, had accepted typical Indian architectural features like the 'Jaali' and the 'Chajja'. The jaali, which is an intricately carved ornamental stone screen, is ideal for Indian climatic conditions, and the chajja, which is a thin projection of stone, protects the walls and windows from the hot summer sun and the heavy monsoon rains. The third feature adopted by the designers was the 'chattri' or the umbrella-shaped dome that broke the monotony of the flat, horizontal skylines. All these features can be seen in South Block.